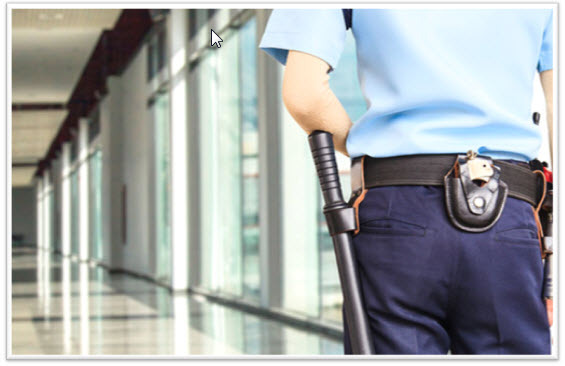 Security Guards to protect to deter, prevent and protect people, areas and equipment within your facility, enforce regulations, provide first aid and ensure safety . Patrol Guards to patrol to deter criminal activity and ensure that all is safe and secure and search facilities, premises and surrounding grounds for vandalism, suspicious persons, unauthorized vehicles or suspicious packages and check locks, doors, alarms, boilers, furnaces, timers, thermostats or any other equipment that would need monitoring. Alarm Response Mobile Personnel will perform a comprehensive perimeter check of your property for signs of forced entry. The Mobile Alarm Response Guard will also check all perimeter doors, windows and gates for signs of tampering or forced entry. Concierges to screen visitors as they enter and exit your facility, watch video monitors, operate and respond to alarm and security systems. Event Security Personnel that provide professional and courteous protection including answering questions, proactive patrolling, access control, crowd control, emergency response, property protections and traffic control for corporate events or a private functions, charity events, concerts and trade shows, large or small, indoor or outdoor. Close Protection Personnel provides security against physical threats for executives and security for family members at home and in transit organizing and implementing secure travel procedures. Both male and female close protection specialists, working alone or as a team.